Returning Your Investment: We work with you and plan the turnaround that makes your investment give back exponentially. 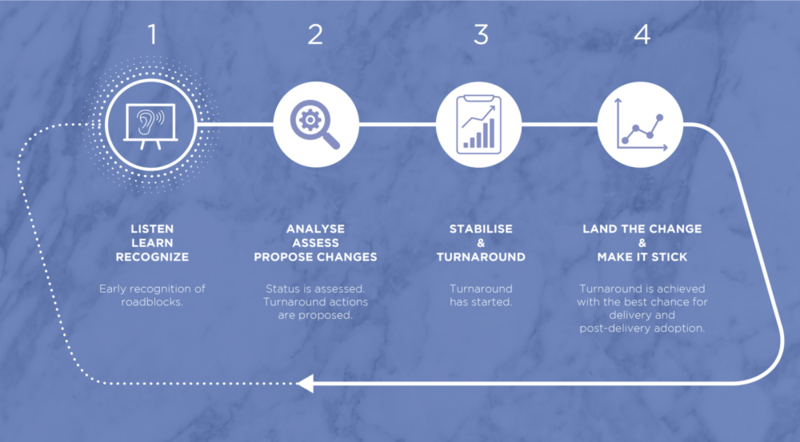 Finding the Root Causes: Our tried and tested solutions are based on identifying root causes and eradicating roadblocks. Stakeholder Engagement: Stakeholders, board members, users are the heart of the organisation. We work to include everyone in the delivery outcome. Reinventing Roles: Every company has existing resources that can boost delivery. We mentor these resources to optimise efficiency and impact. Custom Created: Our interventions are tailored to the size and complexity of the programme, taking speed and budget into consideration. Lasting Tools & Solutions: Our tools and methods stay with your team to be redeployed and utilised for years to come. • Formulating an understanding of your organisation’s methods and culture. • Contextualise history and future in order to identify business outcomes. • Review / put in place tools (like the Change Management Network) to validate scope and map stakeholders. • The outcome? Early recognition of roadblocks that allows for recommendations that anchor the next steps. • Deep dive into the context and arrive at turnaround actions that are meaningful to everyone. • Assess the suitability of the delivery structures. • Review or put in place tools like cross-vertically integrated plans, a RACI model and the Impact Assessment. • The outcome? A full status assessment. Recommendations for turnaround actions follow. • Mobilise and plan delivery while acquiring sign offs. • Put quick-wins in place and remove roadblocks. Set up integrated plans, governance and communications channels. • Put in place tools such as the Business Readiness Criteria and sign off practices for all programme phases. • The outcome? Democratic plans that define and govern appropriately. Turnaround is underway. • Planned activities are in action. They are being tracked and governed in efficient ways. • Run the new plans. Everyone is focused on the delivery goal. • Set up tools to support progress reporting and easy-to-consume internal communications. • The outcome? With the new practices in place accountability thrives. We leave you with ‘added-value’ tools based on learnings. Turnaround is achieved.